As sustainability rises to the top of public policy agendas in American cities, it is also emerging as a new discipline in colleges and universities. Specifically designed for these educational programs, this is the first book to provide empirically based, multi-disciplinary case studies of sustainability policy, planning, and practice in action. It is also valuable for everyone who designs and implements sustainability initiatives, including policy makers, public sector and non-profit practitioners, and consultants. Sustainability in America's Cities brings together academic and practicing professionals to offer firsthand insight into innovative strategies that cities have adopted in renewable energy and energy efficiency, climate change, green building, clean-tech and green jobs, transportation and infrastructure, urban forestry and sustainable food production. Case studies examine sustainability initiatives in a wide range of American cities, including San Francisco, Honolulu, Philadelphia, Phoenix, Milwaukee, New York City, Portland, Oregon and Washington D.C. The concluding chapter ties together the empirical evidence and recounts lessons learned for sustainability planning and policy. "...a welcome addition to the US literature on sustainable urban development and a potentially useful text for sustainability planning classes." "... Sustainability in America's Cities, true to its promise, painstakingly details the history and actions taken by the cities analyzed. ... Overall, Sustainability in America's Cities provides an incredibly detailed account of the sustainability efforts in several major U.S. cities, providing a wealth of information to city planners interested in the efforts of these particular cities." "The evidence these case studies offer is valuable because it leans more toward 'clear empirical arguments concerning what works and what doesn't in cities' actual experiences' than 'outright advocacy' for what should be done. Proven efficacy is critical to launching new initiatives in the U.S., particularly given the lack of a comprehensive national strategy for climate change has left cities with the daunting task of addressing the issue themselves. Many cities also lack the appropriate resources so can't make mistakes financing ineffective programs...The book clearly demonstrates that the sustainability movement in the U.S. is gaining support. However, progress is slow...Slavin is nevertheless optimistic in light of what the case studies have shown." "This book is amazingly rich in its content and breadth— from wind energy production in Honolulu to urban forest restoration and greening food supplies in New York City. It does as much to back the theory of sustainable urbanism with hard numbers and convincing case commentary as any work to date. It also packs a powerful political message— green buildings, green transport, and green energy can translate into green jobs. 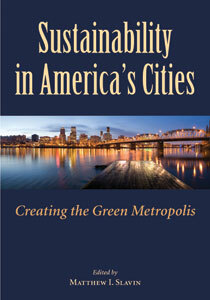 It's a must-read for anyone who cares about charting a sustainable urban future." "Across America, cities are driving the innovative solutions we need to deliver the environmental, social and economic benefits of sustainability. Through a careful examination of some of the successes and failures of our urban initiatives, Sustainability in America's Cities provides timely lessons for those interested in making our buildings, cities, and planet more livable." "Cities' practices can be identified, but without some assessment of how well these practices work in different settings, prescriptions seem premature at best. . . . this book jumps into the void, providing detailed information heretofore not readily available." "The chapters in this book take an optimistic attitude that many readers will appreciate in the current budget-constrained times... Learning from the sustainability cases in this book can lead municipalities, states, and regions to greater achievement in adapting and extending such practices. For that reason, and for the readable, well-written style. Sustainability in America's Cities: Creating the Green Metropolis is highly recommended for academics and planning practitioners."